At Strawberry Hill in Twickenham we are invited to get intimate with Horace Walpole, the man who invented the gothic novel and revived gothic architecture. 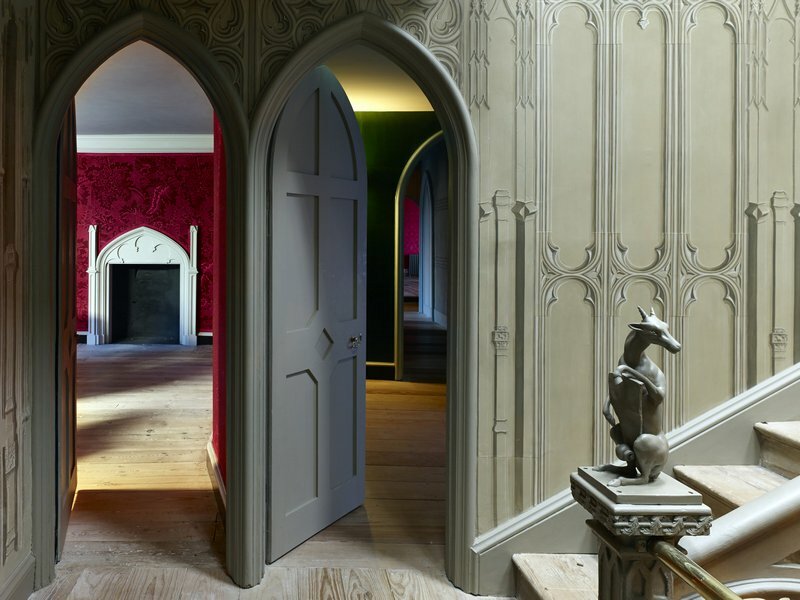 The private apartments in his ‘little gothic castle’ are now open to the public for the first time since the 18th century marking the completion of the latest stage of the house’s restoration. The renovation work in these rooms is impressive, but Strawberry Hill still stands largely empty, bereft of the vast collection of art and antiquities that it was built to showcase. Without his precious possessions how close can we get to the real Horace Walpole? What has been achieved by revealing these private spaces is a sense of the house being a home. The first stage of the restoration, completed in 2010, gave us the theatre of Strawberry Hill, a fantasy castle with its grand state rooms and gilded chambers, a tourist attraction in its own time just as it is today. Now we can visit the suite of rooms Walpole inhabited, where he slept, ate, entertained his closest friends and penned much of his writing. This is also where he dreamt the dream that inspired his novel, The Castle of Otranto, spawning a whole genre of gothic fiction. He was known for many things besides being a novelist: antiquarian, collector, art historian, arbiter of taste, prolific letter writer and bitchy social commentator. And his father was Britain’s first Prime Minister, ‘the Great Man’, Sir Robert Walpole. Horace Walpole enjoyed status, wealth and fame, but constantly worried that posterity wouldn’t be kind to him. In many ways he was right. But if anything stands as his monument it is Strawberry Hill, as perfect an expression of its creator’s eccentricities as any building could be. Six newly renovated rooms were unveiled in March: Mr Walpole’s Bedchamber and Dressing Room, the Plaid Bedchamber, the Breakfast Room, the Blue Bedchamber and the Green Closet. 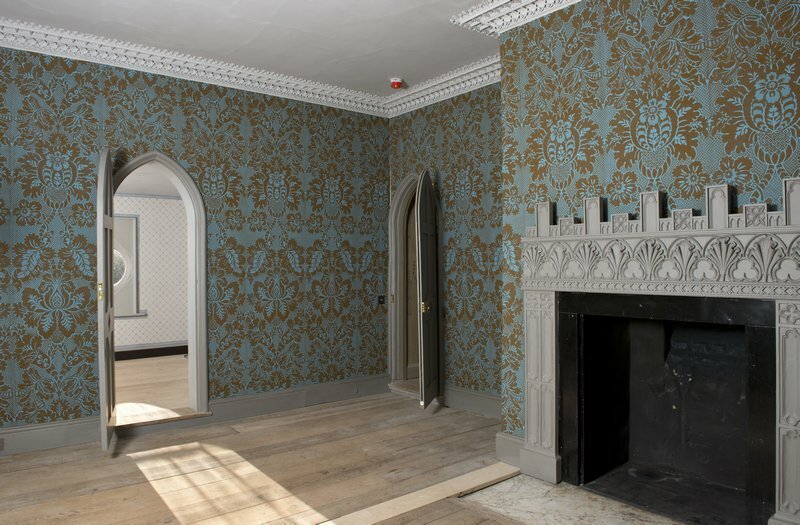 The restoration has focused on the fabric of the rooms, removing later alterations, and reinstating the original gothic ornamentation and rich decoration of the Walpole interiors. 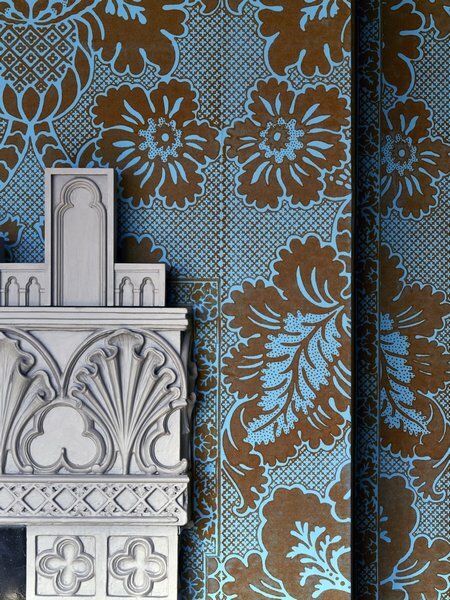 The wallpapers are particularly striking: bold patterns and brilliant colours recreated from surviving scraps discovered under later layers or in the backs of cupboards. The restored papers have been made and printed by hand using 18th-century techniques and materials. Walpole’s Bedchamber, for example, is now returned to his 1756 decorative scheme, hung with dazzling blue and gold flocked wallpaper. At first glance, these renovated surfaces can seem too fresh, too gaudy. Maybe it is because we expect the decoration in old houses to have mellowed with age, or for gothic to mean gloomy. But if so, we are misunderstanding what Walpole intended. He confessed: ‘in truth, I did not mean to make my house so Gothic as to exclude convenience, and modern refinements of luxury. 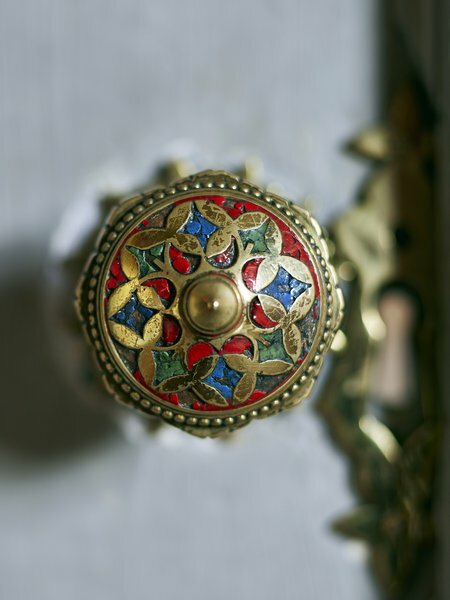 The designs of the inside and outside are strictly ancient, but the decorations are modern.’ The bright colours, vibrant patterns and tactile surfaces of these rooms conformed to the fashionable tastes of his day. Walpole’s medievalism was inflected with Rococo playfulness. He described it as a ‘capricious house’ and ‘the prettiest bauble’; it was meant to amuse and delight, not to be taken entirely seriously. Georgian society loved it, descending on the house in droves. Walpole complained about the troublesome tourists invading his home, but then printed a guidebook, A Description of the Villa of Mr Horace Walpole at Strawberry Hill, to help them make the most of their visits. 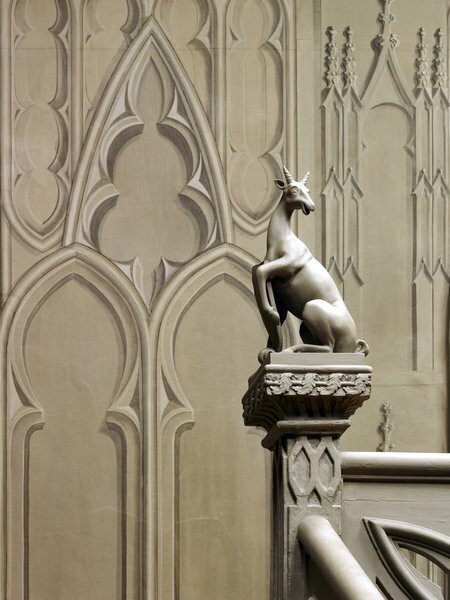 Gothic was the milieu of Walpole’s creative imagination. Just like The Castle of Otranto, Strawberry Hill was a fiction he invented, the seat of a fabricated heritage, full of purchased relics, borrowed coats-of-arms and fake heirlooms. 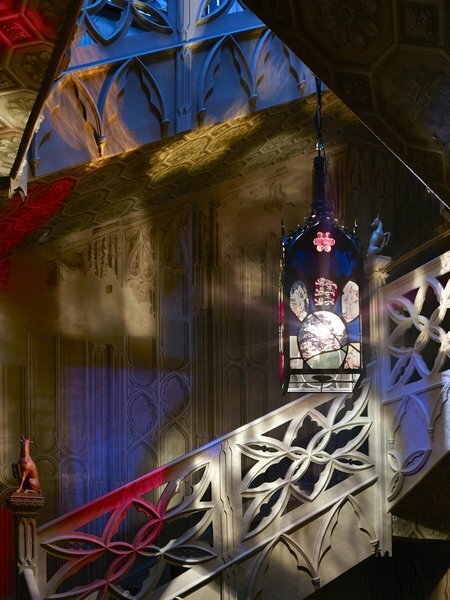 ‘My buildings are paper, like my writings,’ he said, ‘and both will blow away in ten years after I am dead.’ There is much about the house that is illusory: the gothic ornamentation is made of papier-mâché, the medieval tracery in the hall and staircase is trompe l’oeil wallpaper. What did blow away, metaphorically, was Walpole’s valuable collection of art, furniture, books and artefacts. Numbering thousands of items, it was sold off and dispersed in a 24-day sale in 1842. The rooms would have looked very different stuffed full of all these objects. 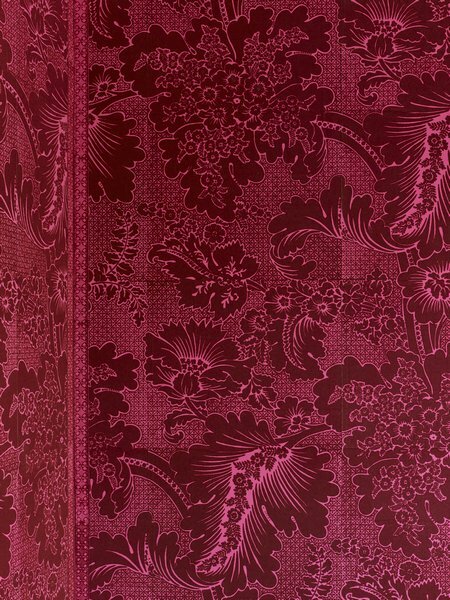 For example, Walpole’s study, the Green Closet, was hung with more than 130 works of art, which would have largely obscured the vibrant wallpaper we can see today. The house is gradually being re-populated with items re-acquired or borrowed, but this will be a slow process. Another solution is to make replicas. In the Blue Bedchamber, for example, we find a copy of one of Walpole’s 18th-century beds, which has been made by conservation students at London Metropolitan University as part of Strawberry Hill’s education and outreach programme. However, ambitious plans are afoot to stage a special exhibition at Strawberry Hill in 2017 to mark the tercentenary of Walpole’s birth. It will feature as many of his possessions as can be identified and borrowed from public and private collections around the world. The project invites comparisons with ‘Houghton Revisited’, the acclaimed exhibition in 2013 that re-staged Robert Walpole’s art collection at Houghton Hall, the family seat in Norfolk. Even if only a fraction of Horace Walpole’s collection can be returned to Strawberry Hill it will transform the restored interiors and bring us nearer to his original vision. His elusive presence will return to the house, expressed through the idiosyncratic tastes and passions that inspired this extraordinary building. 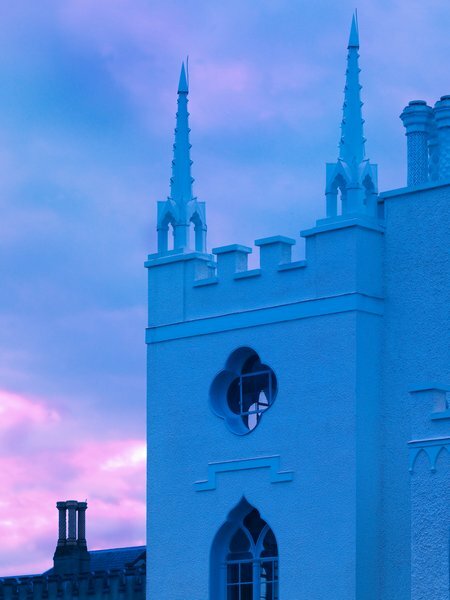 Horace Walpole’s Gothic Castle at Strawberry Hill is open to the public Saturday to Wednesday.